Painted one of my favorite little streets that we found when we were wandering around downtown Mykonos. 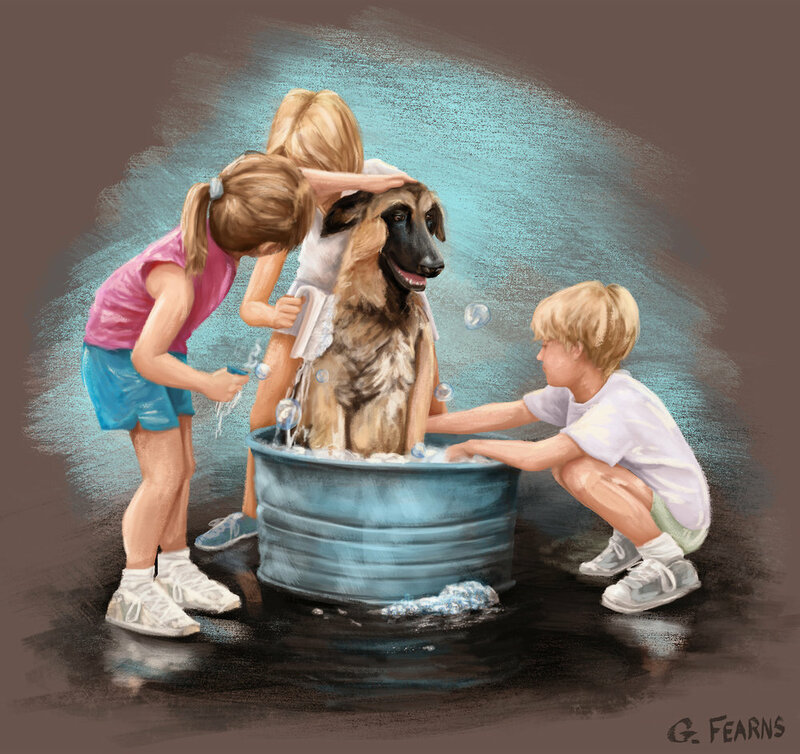 Based on an old photo of Eileen and her sister’s giving their dog a bath in the driveway. On our way off a beach in Paia we walked past a dog relaxing alone on top of a cooler. He was so calm and chilled out I thought he captured the feeling of that town and Hawaii perfectly. Not sure where the owner’s were that afternoon, but in my version they’re surfing while he watches and waits for them to get back to give him a treat from inside the cooler. Some of the best pizza I’ve ever had at the restaurant Bonci Pizzarium in Rome. The crust was crunchy, thick, light and moist all at the same time. Combined with the fresh ingredients it made an amazing slice that I ended up spilling all over myself. Well worth it. 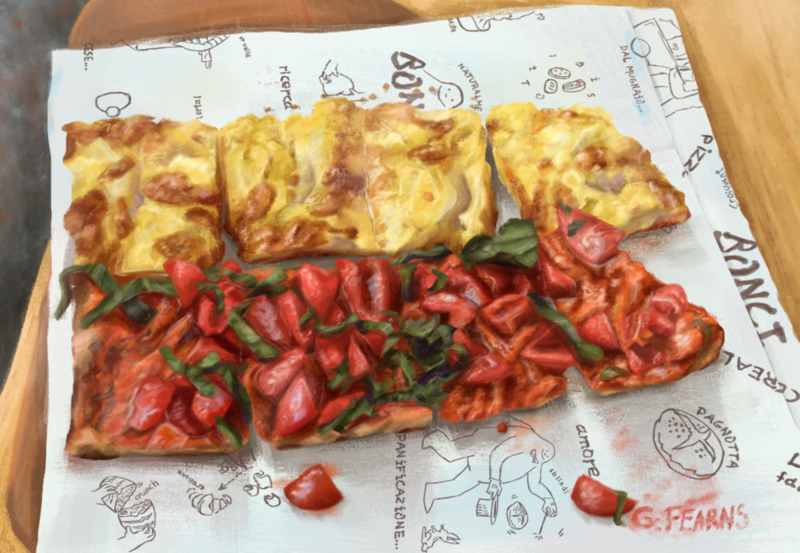 The top is pizza con le patate; thinly sliced potatoes and mozzarella, and the bottom is roasted tomato and basil. Even the paper it was served on is great and ended up being my favorite part of this painting. 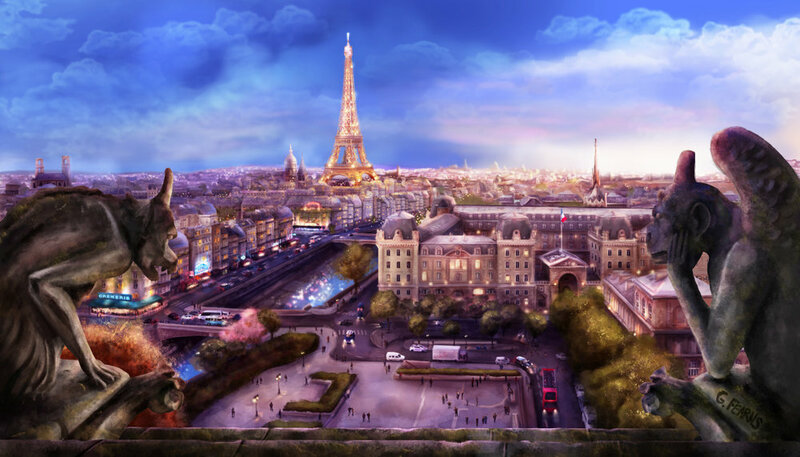 Paris has some pretty great views. Especially ones with all the awesome gargoyles on top of the Notre Dame Cathedral. I loved the 90’s show Gargoyles, so of course I had to do a painting of my favorites that we got to see there. 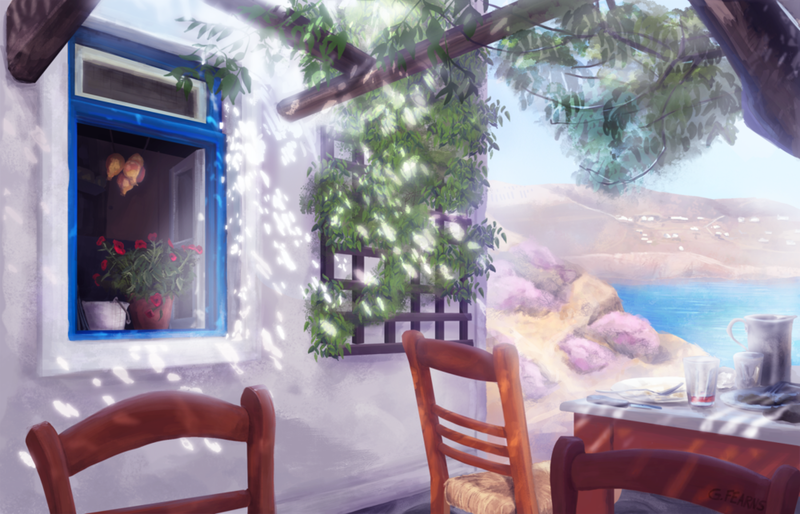 This is of a restaurant called Kiki’s Tavern on the island of Mykonos in Greece. We spent the day on Agios Sostis Beach, right next to it, and then wandered up a path to eat lunch. There’s no sign, but you can recognize Kiki’s by the tree’s growing through the center and covering it. With no electricity/phone they don’t take reservations, but they make up for any wait by giving you free wine until a table’s ready. It was the best Grilled Chicken I’ve ever had served with a baked potato wrapped in tin foil, all cooked on a wood fired grill. It was simple and one of the most beautiful and memorable places I’ll ever go to.